It's July 10. My bike is ready to be picked up from its annual tuneup, and I'm getting pumped about my first upcoming ride! Next week I will bike 116 miles from Fargo to Red Willow Bible Camp at Binford, ND. I plan to bike to Cooperstown, ND on Thursday, and finish off the ride on Friday. Bought some high protein snackies today, and soon will get a bike safety flag with the words "Bike for Justice" on it. But what really has encouraged me is an amazing response already to my fund raising campaign for Lost and Found Ministry and Sister Parish, Inc. More than $5800 has come in, including a $2000 challenge grant ($1000 from a donor friend which will be matched by Microsoft!) Woo hoo! I am now out scouting for monies to match this fabulous grant! 1) Many of you have already sent a donation - and to you I send deep thanks and many hugs. You will be prayed for as I ride next week. P. O. Box 91, West Fargo, ND 58078 OR donate online at www.openingborders.com. 4) Lastly, please pray for this and future rides - for safety, and for new awareness about justice concerns as I speak with people I meet along the way. Remember, I will be praying for you, too. June has arrived, and it is beautiful outside. Biking season is in full-ride mode! That means I’m preparing for Bike for Justice 2014, a ride I have now made for six years to raise money for various organizations that keep moving steadily toward a world where all people are able to live in a just and dignified manner. Folks have been generously supportive and have donated more than $35,000 over the past six rides. Thank you! This year I hope you will join me in helping even more people. 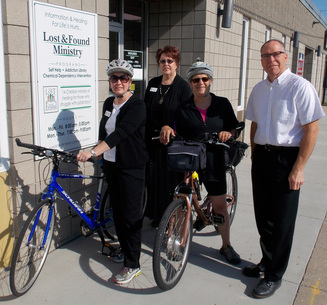 As I pedal several hundred miles over these summer months, I will be praying for two ministries dear to my heart: Lost and Found Ministry and Sister Parish, Inc. Your donations will go to support these two important and life-transforming ministries. Will you join me in supporting these important causes? I am eagerly anticipating the work of my various summer rides and ask that you prayerfully consider making a contribution to reach my goal of $8,000. Thrivent Financial has made the first commitment toward this in the amount of $1200! I carry my list of supporters in my front bike bag and as I ride, I will pray for you and your family. Thank you! P.S. This is it – an ask for a contribution. Checks may be written to Opening Borders with a note to direct your gift to your organization of choice. An acknowledgement receipt will be sent at the end of the summer when I fully report my activities and share some photos. I am grateful for your partnership in this Bike for Justice 2014.